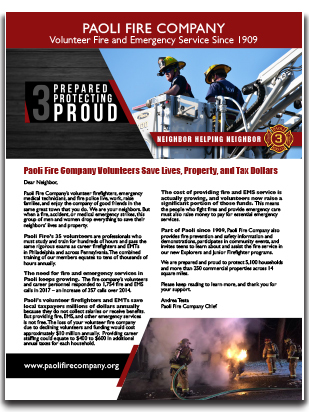 Paoli Fire Company’s volunteer firefighters, emergency medical technicians, and fire police live, work, raise families, and enjoy the company of good friends in the same great town that you do. We are your neighbors. But when a fire, accident, or medical emergency strikes, this group of men and women drop everything to save their neighbors’ lives and property. Part of Paoli since 1909, Paoli Fire Company also provides fire prevention and safety information and demonstrations and participates in community events. Your regular Amazon purchases can help Paoli Fire! Purchase through our Amazon Smile link, and Amazon sends us part of the proceeds. Looking for a speaker for your next event? Book Paoli Fire Company. Your audience will learn about the types of calls we make, the training we undergo, and the effort it takes to keep this organization running strong. Call Leza Raffel at 215-884-6499.